George W. Bush was president, gas cost $1.59 a gallon and the Human Genome Project had just officially ended on April 25, 2003, the date that the National Library of Medicine’s Genetics Home Reference (GHR) debuted. GHR is a free online resource about human genetics created for patients, families, and the general public. The Web site provides a bridge between the public’s questions about human genetics and the rich data that has emerged from the Human Genome Project and other genomic research. 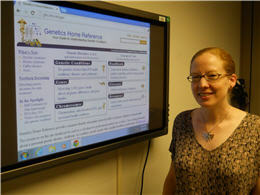 Stephanie Morrison serves as the coordinator and project manager for Genetics Home Reference. GHR provides consumer-friendly summaries of genetic conditions and their associated genes, gene families, and chromosomes. The site also features a primer called “Help Me Understand Genetics,” an illustrated introduction to fundamental topics in human genetics including mutations, inheritance, genetic testing, gene therapy and genomic research. Additionally, GHR offers helpful background information, including a glossary of genetic and medical terms and links to numerous other quality resources. A “Spotlight” feature on the GHR home page highlights important observances and discoveries in the field of human genetics and draws attention to useful learning tools and clinical resources. When it was launched a decade ago, Genetics Home Reference featured 19 condition summaries and 16 gene descriptions. Today, GHR offers consumer-friendly summaries of about 850 genetic conditions, more than 1,060 genes, more than 80 gene families, all of the human chromosomes, and mitochondrial DNA. New summaries are added regularly. GHR currently receives about 43,000 visitors per day and 39 million hits per month, suggesting that it continues to be an important and useful health resource. Besides the general public, users include medical professionals, genetic counselors and journalists. With one successful decade under its belt, one wonders what new resources GHR will offer in future years to educate the public about the fast-growing field of human genetics. May 1, 2013 in Products.